Few weeks ago I was invited to Click on Beauty event hosted by The Body Shop Indonesia. The purpose of this event was to promote The Body Shop online shop. Some of you may have already shopped there before, but I did my first shop at www.thebodyshop.co.id after TBS Indonesia gave me this IDR 1,000,000 shopping voucher to spend at their online shop. Honestly, it's rare for me to spend IDR 1,000,000 in one purchase just because it's a lot amount of money. So I was beyond happy to receive this TBS shopping voucher worth IDR 1,000,000. 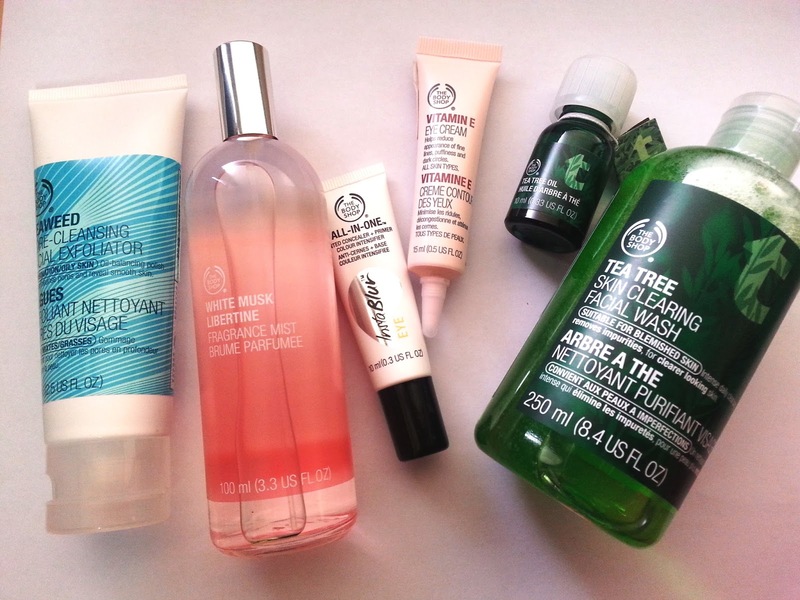 And today, I want to share with you all my haul in The Body Shop online shop. First of all, it was kinda tricky for me to choose products that I wanted. Maybe because I only used few TBS products before, and my favorite product was Amazonian Wild Lily Eau de toilette which was not available at that time on the website ( it's available now!). So for choosing these products one by one, I used the help of Internet. What I did was I browsed on Internet and searched on people's favorite products from TBS. After I gathered all those information I made a list and the list down into these 6 products. This is a popular acne-treatment product from TBS. It has an liquid/oil consistency which needs to be applied by using Q-tip. Many said this product works fast, only 2-5 days the blemishes/pimple will disappear. So many blogger praised this product and I know I am still on search of a good acne product, so I cant miss this one. I believe facial wash has an important role in our skincare routine, moreover when we find a perfect facial wash, it can reduce our skin problems such as pimple, large pores, dull skin, etc. By pairing this product with Tea Tree Oil I hope I could achieve a better skin. Right now I am using Physician Formula Eye Cream, but it's only few dabs left, soon i need to get a new eye cream. And after I saw from their website that TBS Vitamin E Eye Cream is one of their best seller product, I knew I have to get one. This is one of the latest product from TBS on their make up department. Not only Instablur Eye Primer, but they also released Instablur Face primer. Some said this product works wonders for oily lid, and God knows I have a very oily lids especially area under my bottom waterline. Same with my eye cream, soon I will run out of exfoliate cleansing. This product contains scrub that removes dead skin cells, excess oils, impurities and daily grime. I saw one of my friend at work using this product and I've always been curious with it. A light, all-over body spritz with the sensual scent of White Musk Libertine. Some said it could last all day and I cant wait to try it by my self. iya vina, lumayan bingits emang voucher nyaa!